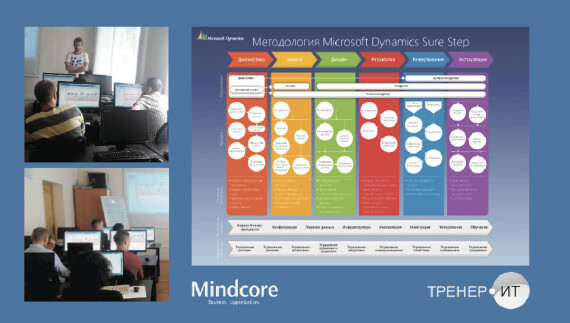 Mindcore Consultants and Project Managers participated in a corporate training “Microsoft Dynamics Sure Step (MDSS) methodology». The purpose of this training was to increase the quality of services of Microsoft Dynamics Products implementation. MDSS methodology contains a large set of recommended tools, documents and approach which improves the quality of implementation and increases the likelihood of success, as well as reducing total cost of implementation. Particularly important is assigning roles and areas of responsibility to the project participants. Rightly coordinated team’s effort brings more efficiency to the project and helps to achieve the project objectives. 3-day training course was conducted by a Microsoft certified trainer Alexey Shamin, 13 years of experience in the field of ERP implementation. He has more than 30 complex and geographically distributed projects in his career. Alexey has gone from an AX and NAV programmer and consultant to the head of Microsoft’s partner, allowing him to share knowledge not only in the field of Dynamics Solutions functionality,but in Project management as well.